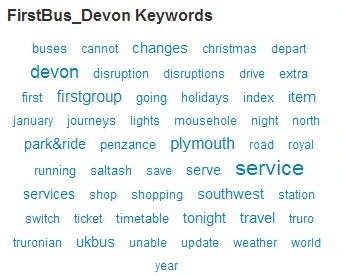 It was back on the 10th December that I posted the arrival of both Plymouth Citybus and First D&C on Twitter. I mentioned than that First had followed Citybus but was informed by First that they were first actually, but the important fact was that both our main bus operators were now up and running on Twitter at about the same time. So about a week and a bit later, how are they actually using the service? 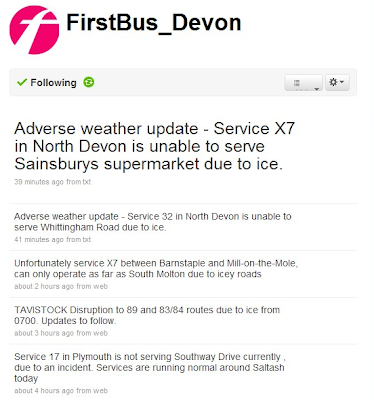 This morning sees quite a few Tweets from both companies as the weather continues to be a problem in some areas and we have seen a road closure in Southway - an ideal situation for Twitter users. 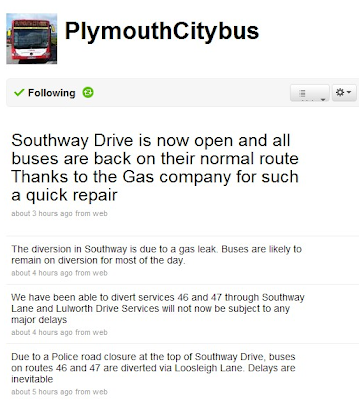 This is typical of how Citybus are using Twitter at the moment with clear details of any hold ups to services and also when services are back to normal. Again the same incident picked up by First although as of yet there is no 'all clear' message. You can also see how First cover a much larger area than just Plymouth. Both companies are using Twitter well to highlight issues like these. Although its early days to get a true image of how their Twitter usage differs these two 'key word clouds' do show slight differences between the two. 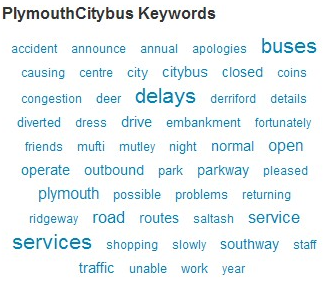 Citybus are highlighting delays more prominently than First and of course are clearly Plymouth focused. First are using their Tweets to highlight both their services and also First Group promotions. As it stands at this moment in time Citybus have 53 followers and First have 38. Citybus have sent 32 tweets against 24 for First. Although it isn't a race in any way both companies will be looking to maximise their followers in the new year as it can prove a really useful way of getting up to date info to their passengers. Keep up to date with service information, offers and more by following our regular tweets! And until 31st January 2010 anyone who follows us will be entered into a draw with the chance to win a FirstMonth Devon & Cornwall ticket worth £90! If you are already following us why not tell a friend and you'll both be in with the chance to win the free travel! Omnibuses: Islwyn Sale Hits Buffers? Early days, so no doubt lessons are being learned. Out of interest, Metrobus has taken things a step further - they have apparently linked Facebook, Twitter and their own website, so updating Facebook, automatically sends out a similar tweet and feeds into a scrolling travel update section on their website's home page. Facebook and/or Twitter state on their site that linking of the two networks by commercial companies is not allowed. It is okay to link the two for personal use it would appear.